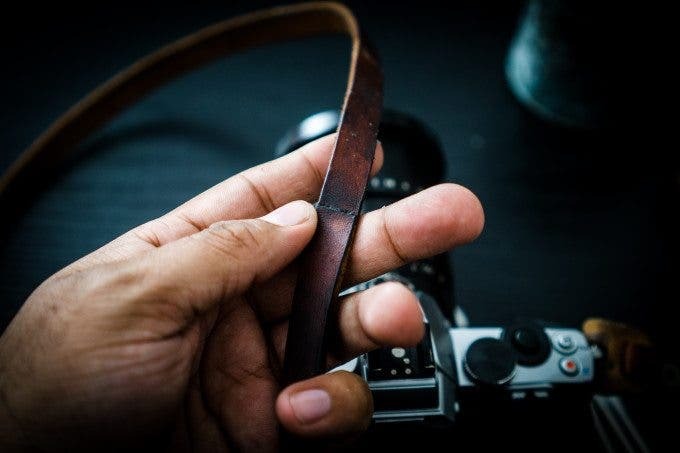 If you look up lots of the most popular leather camera straps online, chances are very high that we’re going to show up in the search results. 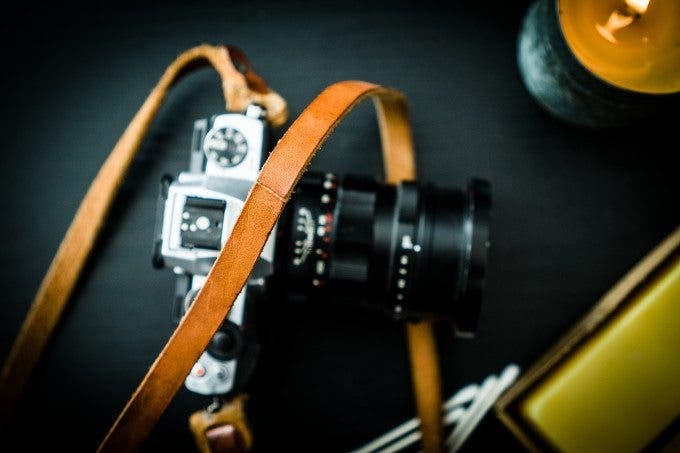 We’ve got loads of reviews on leather straps and folks ask us every day about these straps. In fact, it’s gotten to the point where we’ve rounded up many of our favorites. But once you’ve got a strap, how do you take care of it? We’ve got a quick tutorial for you right here. Leather moisturizer oil. I use Otter. Some sort of wax. 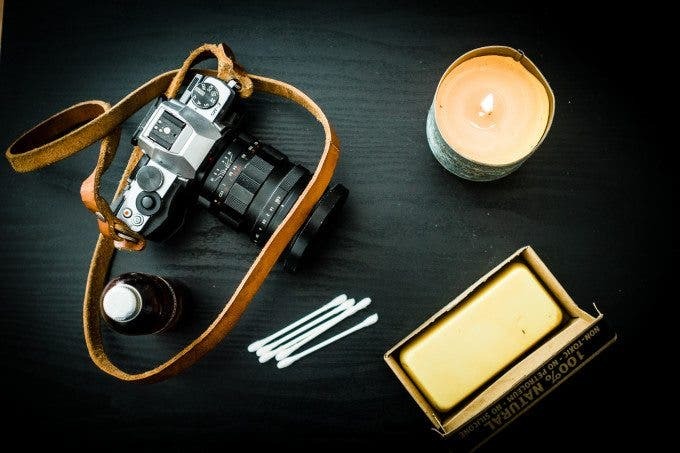 I also use OtterWax, but Beeswax is what many strap manufacturers use. Before you go on: I don’t recommend that everyone does this. It’s a fairly long process and requires being conservative about everything you do. A little goes a long way, and we say that a couple of times here in the piece. 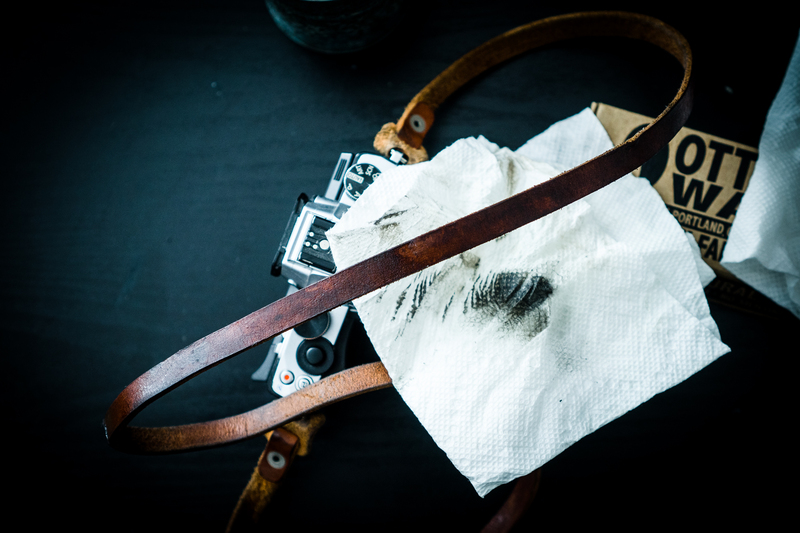 Before we go into this, I want you to consider the fact that I’m doing this demonstration using the TAP and DYE Legacy shoulder strap attached to my Olympus OMD EM5. It’s been used a lot of times and even started to develop cracks from the use. See that crack in it? Yeah, that’s proof of how much this thing has been used. 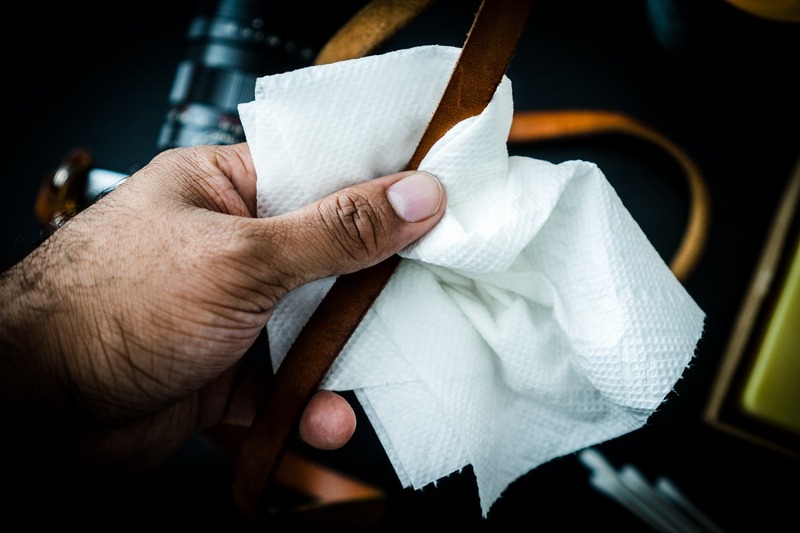 First off, you’ll want to use a clean paper towel/rag and wipe down the strap with water to give it a bit of a cleaning. Wrap the paper towel around the strap, pinch the wet area and run it down the strap. After this, apply oil to a paper towel. Since this is a longer strap, I’m applying a rather healthy amount. Considering that I’ve done this with many other straps, it’s also the first time I’m doing it with this particular strap in these images. 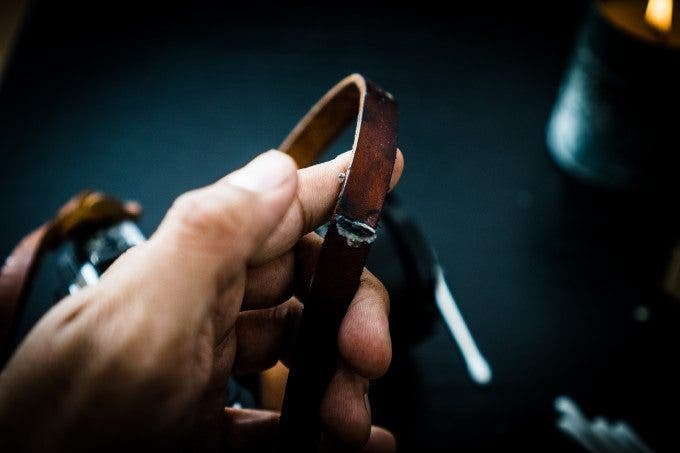 Rub the oil down on the strap in the same way that you did when cleaning it with water. Be sure to apply lots of pressure and get the oil in there. This oil moisturizes the strap and keeps it pliable. In the image above, the darker area is clearly the oil-moisturized area. 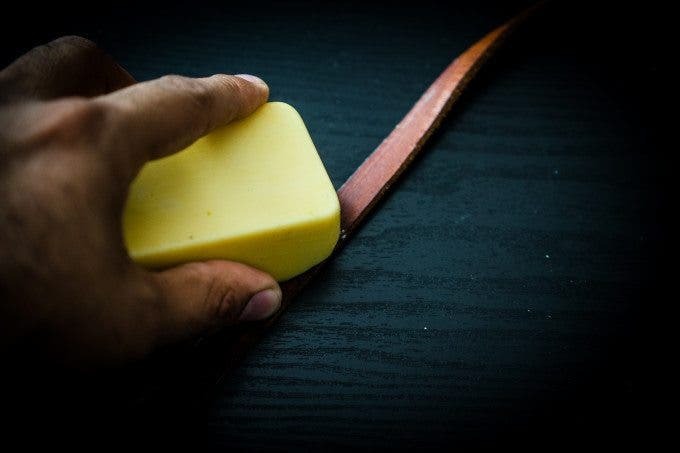 After this process, use the wax and rub it against the strap. 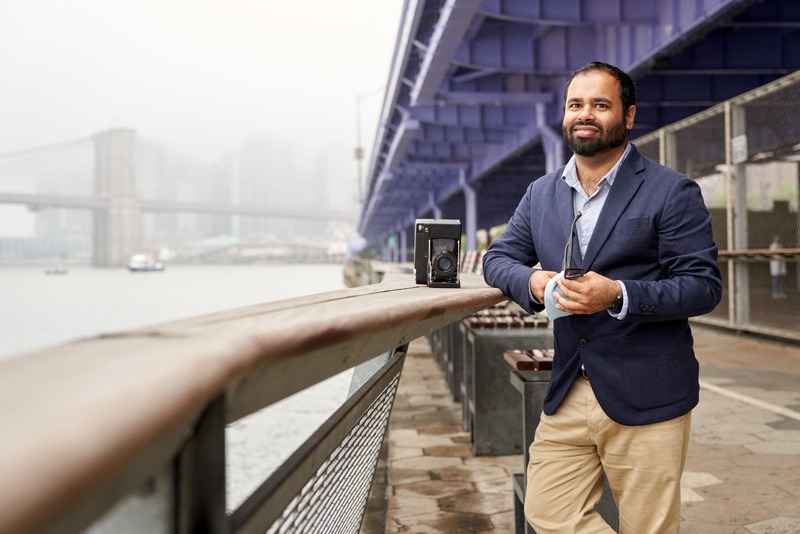 But be conservative about its application–a little goes a long way here. When you’re done with this, bring the waxed side (the outer side) into the candle and run the strap along the flame. Don’t get too close; if you start to see black ash, then pull back, but you’re bound to get a bit of it. The alternative is to use a blow dryer, but that’s less fun and much more time-consuming. Using your fingers smooth out the wax. Repeat the flame process. Even if there is black ash on it, don’t worry about it just yet. Keep doing this to the strap until you’ve got a new thin seal on top of the seal that the manufacturer put on it. Remember the oil treatment you did before? It’s time to do it again. 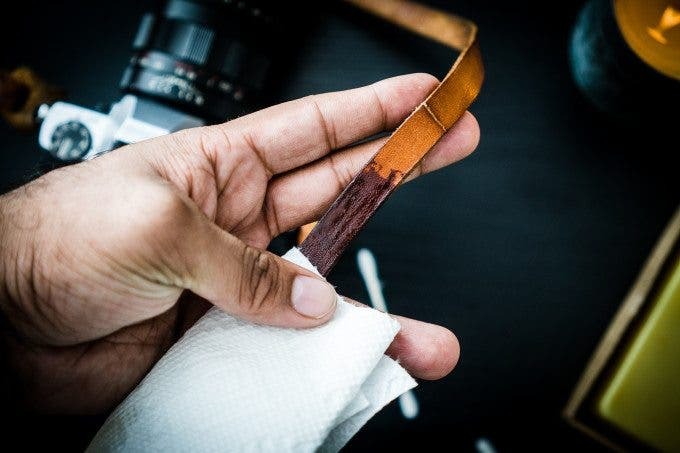 This oil treatment will make the strap more pliable, clean off any ash and also remove excess wax.